Several forces aligned themselves to make it all happen. These included the stadium, the lineups, and the weather. Tiger Stadium had always been a hitters’ park and was ranked by some as the most homer-friendly in the big leagues.2 The pitching staffs of both teams ranked toward the worst of the league in ERA and home runs allowed that year. The starting lineups on both sides included several players with established home-run power; the most notable were Frank “Big Hurt” Thomas for the White Sox and Cecil “Big Daddy” Fielder for the Tigers. For the fans, the 3-hour, 46-minute contest was far from a boring, one-sided slugfest. There were three ties, three lead changes and scoring in eight of the nine innings. The outcome remained in balance until the final at-bat. Things started well for the Tigers. In the bottom half of the first inning they began the home run deluge off Chicago starter James Baldwin, racing to a 4-0 lead. Chad Curtis led off with a 415-foot home run to left-center. After a walk to Lou Whitaker and a single by Alan Trammell, cleanup hitter Cecil Fielder came to bat. Sensing the conditions and what might be in store, Chicago center fielder Mike Devereaux retreated to a fielding position well over 400 feet from home plate. Detroit publicity director Dan Ewald commented,“I never saw anyone play as deep in my life.”7Fielder was equal to the challenge, launching a 463-foot blast over Devereaux’s head into the lower center-field bleachers. After one inning, the Tigers were up 4-0. The White Sox responded with one run in the second. After two hits, Karkovice’s sacrifice fly provided Chicago’s first score. In the bottom half of the inning, it was deja vu for the Tigers. Curtis led off again and hit another400-plus-foothomer to left-center. After a single by Whitaker and Trammell’s strikeout,Fielder also repeated his first at-bat with a second 400-foot round-tripper. That was it for rookie pitcher Baldwin. Reliever Kirk McCaskill escaped the inning without further scoring, but the Tigers now led, 7-1. Detroit starter David Wells had entered the game with a 2.81 ERA. With a six-run lead, things looked good for the home team; but on this day no lead was safe. In the top of the third the White Sox quickly put two runners aboard on an error and a walk. Thomas doubled in one run. Two more scored on a groundout and a sacrifice fly. Chicago was back in it now, trailing by just three runs. The Tigers retaliated in their half of the inning. Chad Curtis again came to the plate after one out. This time, McCaskill kept Curtis in the park, holding him to a double. One out later, Curtis scored on a single by Trammell.The score was 8-4, Detroit. In the fourth Wells came in for a surprise against the bottom third of the order.Aided by the wind,Ron Karkovice, Ray Durham, and Craig Grebeck swatted consecutive home runs to left field. For Durham it was his first in the big leagues. For the astonished Grebeck, it was his only homer of the season. After the game he remarked,“I don’t ever think home run. I can’t hit home runs.”8Wells departed and reliever John Doherty retired the next three hitters. Detroit did not sit still in the bottom of the inning. Leadoff hitter Kirk Gibson celebrated his 38th birthday with a 410-foot homer to deep right-center. Again the Tigers only scored one as Chicago inched closer, 7-9. The fifth inning was quiet in terms of home runs, but the White Sox crept even closer. They scored twice on a groundout and a sacrifice fly to finally tie the game, while the Bengals, for the third straight inning, managed only one run, on an RBI single by Whitaker. But Detroit was back on top, 10-9. The two teams traded home runs in the sixth. Frank Thomas smoked a line drive into the right-field stands to tie it up again. Gibson responded with his second home run, this one traveling 429 feet. Later in the inning the Tigers failed to score with the bases loaded, as Lou Whitaker flied out. Detroit still led by a run at 11-10. In the seventh Chicago tied it yet again, this time on Karkovice’s long homer to left-center. Detroit again loaded the bases with two outs, but could not capitalize. For the first time in the game, the Tigers were held to a scoreless inning. The score was now tied at 11-11. The Tigers batted in the bottom of the eighth trailing for the first time. With two outs Whitaker answered with a wind-assisted home run to right. As he rounded the bases, “Thus Spoke Zarathustra,” the theme song from 2001: A Space Odyssey, the home-team home-run anthem, played on the stadium speakers for the seventh time that day. The music matched the moment in that four records had just been broken. The combined 12 home runs by both teams set a major-league record. Whitaker’s blast was the 10th solo home run, another record; the seventh homer by a Tiger, a club record (since broken); and finally, extra-base hit number 21, an American League record. These records were of little consequence at the moment, as Detroit still trailed by two runs. The White Sox brought in their closer, Roberto Hernandez. The next two batters reached base –Trammell on an error and Fielder, hit by a pitch. Gibson came to the plate looking for his third homer. He had hit the game-winner against Hernandez on Friday night.This time Kirk flied out to end the inning. “I missed the pitch this time, I just missed it,” he said later.10The Tigers were now on the short end of the score, at 14-12. Chicago failed to score in the top of the ninth inning. As the Tigers came to bat, the crowd stirred.Today anything was possible. Travis Fryman singled to open the frame and bring the tying run to the plate. However, the next three batters went quietly on two strikeouts and a popout to end the game. The ninth inning was the first in the game in which no scoring took place. In spite of all their homers and the early lead, the Tigers lost, 14-12. They left 15 runners on base and went only 3-for-14 with runners in scoring position. The loss was agonizing. 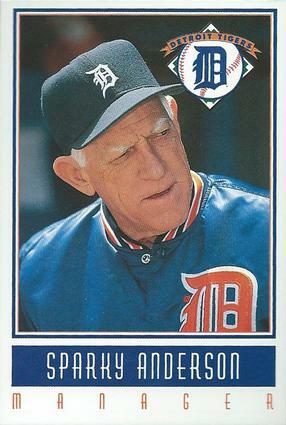 In his last year of managing, an unhappy Sparky Anderson moaned, “It’s silly to give up runs like that. … I don’t think that’s a record to be cherished.”11 The always competitive Gibson lamented,“It’s an outright crime to lose that game.”12In the other locker room the White Sox were elated. “Crazy game,” said Frank Thomas, “…(W)e showed we can come back and play winning baseball.”13 All said and done, it was a game for the ages. In addition to the sources cited in the Notes, Retrosheet.org and Baseball-Reference.com were also accessed. Knight, Keith, and Alex Schuster.“A Study of Home Runs in the Major Leagues,” Department of Statistics University of Toronto, May 1992. Jerry Nechal telephone interview with Mal Sillars, consulting meteorologist, October 9, 2014. 1 “Tigers, Sox: It’shomerific,”San Francisco Examiner,May 29, 1995, D5. 2 Keith Knight and Alex Schuster, “A Study of Home Runs in the Major Leagues,” Department of Statistics, University Of Toronto, May 1992. 4 Richard Sparago, “How Does Weather Affect Baseball?,” WXedge.com, April 22, 2012, http://wxedge.com/articles/20120422how_does_the_weather_affect_baseball. 5 “Tigers, Sox: It’s Homerific,” San Francisco Examiner, May 29, 1995, D5. 6 Associated Press, “This Is the Ultimate Home Run-Run Derby. White Sox, Tigers Hit a Record, 12,” Los Angeles Daily News, May 29,1995, S3. 7 Joe Falls, “Memorable homers come to mind, naturally, during historic day for long-ball hitting,” Detroit News, May 29, 1995, 2B. 8 Paul Sullivan, “Sox Survive Record 12-HRTilt,” Chicago Tribune, May 29, 1995, 1. 9 Tom Gage, “Whirlwind Game Befuddles Curtis,”Detroit News, May 29, 1995, 5B. 10 Tom Gage, “Bats Boom During Entire game, but It’s a Bust in the End for Detroit,” Detroit News, May 29, 1995, 5B. 12 Tom Gage, “Bats Boom,”Detroit News, May 29, 1995, 1B.